Why B physics? Why not A Physics? In my last post, I showed that LHCb is the best LHC detector for B physics, using the decay of the \(B_s\) meson into a \(J/\psi\) meson and \(\phi\) meson as an example. Today I’m going to try and explain why we want to study this particular decay and show you our latest result. The reason we are interested in studying the decays of B mesons is that they may shed light on one of the major mysteries of the universe, namely the source of the observed matter-antimatter symmetry. Matter and antimatter are assumed to exist in equal amounts at the beginning of the universe, but as the universe expanded and cooled, an asymmetry developed between them, leaving a universe completely dominated by matter. The Standard Model predicts an asymmetry between matter and antimatter, but at a level that is too small to explain the observed asymmetry in the Universe. Deviations from the predictions would indicate new physics. As an aside, the difference between the properties of matter and antimatter is called CP violation. I bring up this factoid as it makes up part of the LHCb logo, which I thought was quite clever when I first saw it. 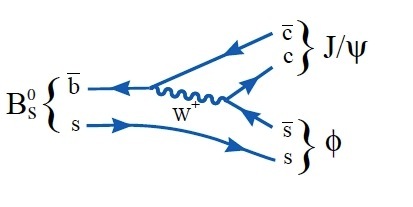 Anyway, one area in which the Standard Model predicts an asymmetry is the \(B_s\) meson system, that is, anti-\(B_s\) mesons are not exact mirror images[*] of \(B_s\) mesons. This difference is encapsulated in the \(B_s\) mixing[***] phase \(\phi_s\). This phase is what can be measured from the decay, \(B_s \rightarrow J/\psi + \phi\), which we just presented at the Lepton Photon conference in Mumbai. Okay, I know there’s a lot of information on this graph, so let’s go through it piece by piece. Firstly, the x-axis represents the \(B_s\) mixing phase, \(\phi_s\), while the y-axis represents the \(B_s\) decay width[****] difference \(\Gamma_s\). Both of these properties are shown as it is not possible to measure them independently. The Standard Model prediction for both of these variables is shown as the black point, while the CDF, D0 and LHCb results are shown as coloured contours, with the solid line representing the 68% confidence limit and the dashed line showing the 95% confidence limit. The results of the measurements favour two regions, one of which is located around the Standard Model prediction, though not centered on it, indicating the possibility for new physics. 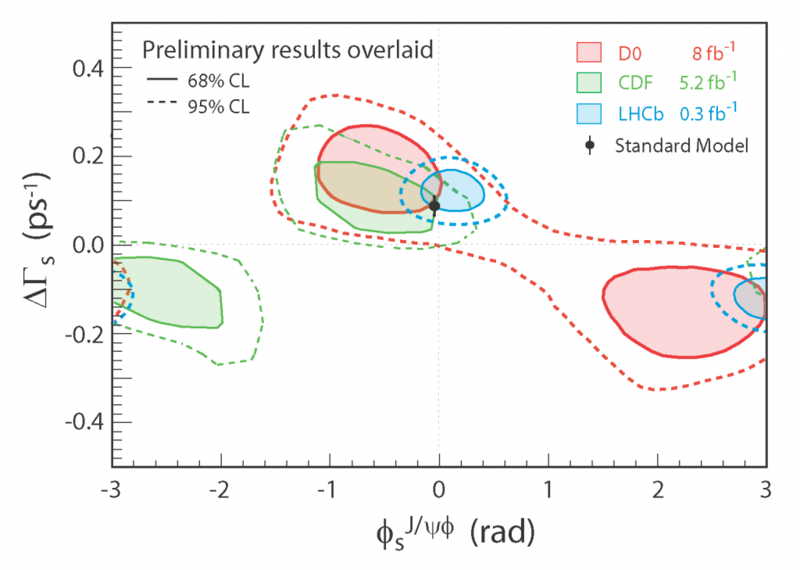 The LHCb result however, is disappointingly much closer to the prediction than the CDF and D0 results. Only more data will tell us the answer to the million dollar question: Is it Standard Model or New Physics? [*] I’m assuming here that you all know what antimatter is. If not, a common analogy is that antimatter is the mirror image of matter. 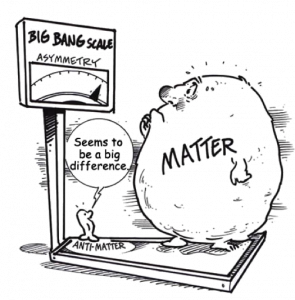 More technically, antimatter has all the same properties of matter, apart from opposite charge and parity[**]. For example, the antimatter particle of a negatively charged left-handed electron is a positively charged right-handed positron. [**] Parity is another name for chirality, which Flip explains very well in this post. [***] A very interesting property of neutral mesons, such as the \(B_s\), is that they can spontaneously transform themselves into their own antiparticles (and visa versa). This phenomenon, known as flavor oscillation or mixing and I’ll definitely be discussing it in a future post. [****] It turns out that one of the possible differences between \(B_s\) mesons and anti-\(B_s\) mesons is a property called decay width.